As I exited the airport and wanted to ensure I had some local cash for food, bus ticket, train, etc. things got confusing fast. As I approached the Global ATM machine located near the exits of the airport, a woman from England was spewing vulgar language at the machine and quickly pointed out to me there was no “English” button. In fact, there was, but only for cash advances (these charge a 1% fee + about $15 from your bank to do a cash advance). After a couple attempts myself to get the machine to spit out some cash, I too, gave up and made my way to the bus ticket counter to pay with a credit card. The following morning I noticed a bank at the bottom of my apartment. The bank was closed, but there were three Global ATM’s just inside the door with no one inside. This was my chance! Without the large crowd around, I was determined to figure out how to make the machine work, preferably in English. After 40 minutes, I surrendered to the ATM. It had certainly won the battle, but I knew there must be a way to get cash, so I reached out to an acquaintance in the area that has lived in Seoul for eight years. He stated that usually the only ATM’s that work with foreign bank cards are at convenience stores or in the subway. So what are these ATM’s? They are the standalone machines that say 365 on them, as shown here. 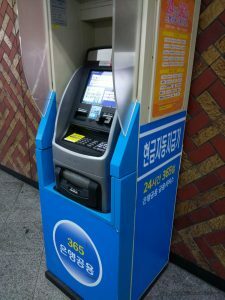 In my journey to find the ATM, I tried every machine I came across during my four hours of walking the city and I did find two additional ATM machines that will give money. They are Citibank and KEB machines, but I did not see them in or near the subway. So while you plan to make your way from the airport to the dorms, be on the lookout for the ATM machines listed in order to get cash. If you don’t see one and can’t get your card to work at the Global ATM’s in the airport, it should not be an issue. Check the subway on your way to the train, but know if you need to pay with USD, that 1 USD is worth about 1075 Korean WON and that credit cards seem to be accepted everywhere in the area. ← Follow us in PyeongChang!